Genesis has contracted with area human service providers and funding agencies to provide special on-site support services to the tenants. Dwelling Place of Grand Rapids, Inc. provides apartment management services. Families and individuals are encouraged to apply for these apartments. Contact Corrie Krol (281-0417) for information and application process or find application forms here. These apartments offer a friendly setting within a larger residential community. Residents will be able to enjoy the neighborhood of green trees and grass on rolling hills and be near city conveniences. 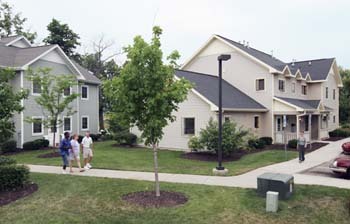 The 23 Genesis East permanent supportive housing apartments are located near the corner of 44th and Breton Ave. They are on "The Rapid" bus line and are close to Kentwood businesses, manufacturing operations and shopping malls. All of these apartments are dedicated to providing affordable housing to low-income individuals and families with disabilities.